With malling becoming such a hype, it's natural to be caught up in joining one yourself. You meet other mallers that share your interest, increase your shop size and possibly end up in a hut, and of course, see an increase in sales resulting in a larger profit! But what happens when you tire of following your mall manager, and want to venture out into the world of malling as a leader? Could you be ready to take the huge step as a manager of your own successful mall? What do you need to do to make that happen? Reading this guide will help you make your own mall banner, start a list of open positions, and most importantly, find members who will fill your positions! Before thinking of opening up a mall to the public, you have to start planning. I know it's tempting to jump right in and find members, but it's more professional to have everything set up and ready to go. If your mall isn't absolutely planned, it's going to look sloppy and disorganized, and no serious mallers will want to join. Before recruiting, you will need to make your mall banner, your website should be ready to view, you have goals in mind, and, of course, you must have the right attitude! It's important when starting your own mall to be excited about it and be able to see yourself working as a leader. If you're reading this article, chances are, you have leadership potential and this is why you are considering starting a mall. However, if you don't have a large, stocked shop, you have a few things to work on. As a general rule, your shop needs to be at least 100 sizes larger than your minimum requirement for joining your mall. For example, if you want to pose a size 300 shop requirement as a rule, your shop should be at least a size 400, or 400 by the time the mall is opened. This sets a good example for prospective members, and makes you seem more professional. This would cost you almost 16,000,000 neopoints to upgrade to a size 400 if you were at a size 0 to begin with. If you're at a size 100, it will cost almost 15,000,000 neopoints. It will cost 12,000,000 if your shop is a size 200, and if you're a size 300 it will cost approximately 7,000,000 to upgrade to a size 400. Your shop should be fully stocked (or at least five pages full), neat, orderly, and easy on the eyes. This is to show new members that not only do you care about your shop and know how to bring in sales, but that you follow your own rules. Believe it or not, a lot of unqualified managers don't follow their own rules. This is a reason why so many new malls fail within their first three months. So you've upgraded your shop, cleaned it up, and you're ready to begin planning. The first thing you need to decide is what shops you want to advertise on your mall banner. The odd categories can be combined however you want. Just try to keep the amount stocked equal. For example, you wouldn't want to put avatars and maps together, because that's going to be too much stock for one person, and not enough for others. Avatars is better left on its own. Pharmacy and neggs is not a good combination either, because there's not enough to stock. You also want to try to bring this down to ten to twelve shops, unless you're considering doing notice board ads, but we'll get into NB ads later. a specialty shop like, faerie, pink, spooky, etc. Unless you have a prospective member that stocks any of these items and specifically asks if there's room in your mall for him/her, then it's not recommended to have these shops in your mall. They're extremely difficult to fill. Have you decided on which shops you want your mall to offer? If so, read on to the next section! So you're ready to start working on your banner? Got your shop ready? That was fast! Let's go over what a well-done banner needs before opening it to the public. A theme and a name. It can be neo-related or not, the choice is yours. Your entire banner should be centered around your theme, so deciding on this is where you will start. Once you've figured out what theme you want for your mall, you need to decide on your colors, images, and shop buttons. Your colors and images should be, once again, centered around your theme. Do you want a huge picture of King Hagan for a Brightvale themed mall? What about palm trees and neopets basking in the sun for a Mystery Island theme? You need to decide this. You also need to find pictures of items for your shop buttons. Your buttons are going to have the name of the shop (wearables, books, food, etc.) and two or three images of items that might be sold there. It's best to have colors that complement your banner on your buttons, so this may take a while. Remember - the better your banner looks, the more people will like it and want to proudly display it in their shops. Plus, don't forget - with an amazing banner, more shoppers will click on it, increasing your sales! Have you decided on fonts yet? As a general rule, the title of the mall is displayed with a fancy font, while the names of the shops are displayed in a plain, easy-to-read font. Next, you will put in your Faerie Quest buttons. 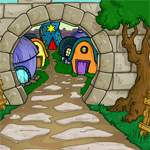 Faerie Quest buttons are typically at the bottom of the banner, but this is YOUR banner, and you can put them where you wish. It will be incredibly hard to find pictures of faeries that match your theme, so don't spend too much time on this. Just find images you like and look nice on your banner, and move on to the next step. Once your banner is finished, it's time for the tedious part. You have to code your banner. When you were in a mall, you could hover your mouse over any of the shops, and if you clicked, you would be taken to that particular shop in the mall. Your mall manager made this possible by using something called an image map. You will be using an image map to code your mall, so when you start recruiting members, you can code them in easily. This is very, very tedious work, and one little slip can throw you off completely. Don't get frustrated, just keep trying. Practice makes perfect! After three or four times of coding your banner, you'll be able to finish this in about twenty minutes. It will get easier! Also, it's understood that you cannot code any shops into your banner right now, because you don't have members yet. In the meantime, you can have your shops link directly to your mall website. This brings us to our next section. Every successful mall has a website, and you should have yours up and running before recruiting. Designing a website is difficult if you don't have experience with html or css, so if you are willing to take the time to learn, then please do so. If not, there is no shame in asking someone to make one for you. So if you're not handy with coding, start looking for someone to design one for you or find a nice pre-made. Once your website is designed, you will need an available petpage to host it and fill your site up with content. Your content will include everything your mall members need to know about the mall, as well as some other help and tips. First bit of content - your opening message. You could include your start date (the day you opened or will open the mall up to the public), things that make your mall different, who founded it (you), and any goals you hope to achieve. Since you're just starting out, one of your goals may be to have a full, active mall. Another could be opening up a guild, many successful Notice Board ads, basically anything you hope to accomplish. Another section to include is a list of all positions. This gives prospective members an idea of what your mall has to offer. This should be easy for you, because you already have all your positions on your mall banner. If you're looking for more positions because you're doing NB ads, then you can make a note of this in this section. Open positions will be on your website as well. This will be easy for you, as all positions (except the one you're taking) will be available. Some optional sections are links to any neosites you find helpful, and a member section. If you have a few favorite restocking, stamp, or other guides, then you can post them in a separate section. Other members may want to look at them and will find them helpful. Your member section would include the member's username, shop size, any comments you have about their shop, their position, and anything else you find helpful. You will really thank yourself in the future for having a member section because when you're going through weekly and checking their shops, you'll want to be able to find it in one click. You will also need a graphics section. This is where you will put the coding for your mall banner, shop banners if any, and any other graphics you want to share with your mall members. You can put the coding for graphics into a text area so your members can copy and paste it into their shop. The last section of your website to go over is your rules and requirements. You will want these listed on your website so they are easy to find and impossible to ignore, but the category is so broad that I felt the need to give it its own section. If you haven't already decided on a minimum shop size requirement, a good guide to go by is market sized shops. This means that your members are in a market. Anything smaller than market size is going to be a hassle. If you are in a market, you are either a serious maller or care about your shop. If your shop is smaller you may be serious about malling, but if you really are serious you will upgrade your shop to market size. You will also get more shop hits due to hut hits, which you can only receive in a market. You can find out the lowest shop size to be in a market by visiting the Haunted Marketplace. The second thing you need to decide is how much shop stock will be devoted to a specific category. For example, if you're stocking wearables, how many items have to be wearables, and how many items can you sell that aren't within the wearable category? A good number to go by is eighty percent. Meaning, if your shop is a size 1,000, 800 items should be wearables, and 200 can be any other items you want to sell. When you figure this out, post it as a rule so your members know how many items they can stock. Another option is a page number requirement. You can require 8 pages to be stocked with shop-specific items, and 1 page stocked with other items, although this will be more difficult to track, which brings us to our next topic - how many pages do your members have to have in their shop? Do you want to impose a page requirement? This is a typical rule in most malls, because when people visit a shop in a mall, they want to see a variety of items. Eight is a great number to set your requirement at. Can your members advertise shop directories? What about other malls? Shop directories are acceptable, because the directory will only advertise shops, not malls. Allowing your members to host graphics or advertise other malls is not advisable. Why would someone want to advertise a mall they're not in unless they're not happy with their current one? That will send a certain message to others about your mall. There are a couple more rules you may want to cover before allowing people to join. The mall banner should always be in your members' shops and in yours, no exceptions. If someone doesn't have the banner in their shop, then you won't get hits from that particular member. If you're starting a guild, is it optional or mandatory for members to join it? Lastly, if one of your members is going on vacation or leaving the mall permanently, do they need to leave a notice? How long should that notice be? If you're considering doing Notice Board ads for your mall members, there are a few things you should keep in mind. If you're planning on doing weekly ads, it's advisable to put up enough neopoints to be on the first page. Any more than the bare minimum is usually not worth the neopoints, no matter how many different shops you have in your mall. Remember, the more people you have in your mall, the less expensive your NB ads will be. You will all be splitting the cost evenly, so it's advised that you have as many shops as possible, but also remember that people should be able to fill up three pages of their shop easily. If you're ever planning on doing an NB ad for 4,000,000 neopoints, then you should consider having two people per shop during those ads. You can find plenty of people that will fill in for NB ads only. If you only rely on your mallers to shell out the neopoints for the ad, then nobody is going to make back what they put out for the ad, rendering the whole thing useless. Once you've decided on an amount to do for your ad, there are a few things you should know before actually posting it. When designing your ad, it should have a link to all shops in the mall and two separate buttons for Faerie Quests and Shop of the Month. It is optional to do one button for your faerie shops, but if you try to include all faeries and shops on your NB ad, chances are, it's not going to fit. NB ads have a maximum 2,000 character limit, and coding in the faerie shops will push you over that limit. Your ad should be set at 540px x 540px so it will fit perfectly into the ad slot. You don't want people to have to scroll vertically or horizontally to see the whole ad, and this size will work perfectly. You also need to understand that once you post the ad, there's no point of return. It's up, and there's no changing it. So make sure it's perfect and all shop owners are on it before publishing. Congratulations! You've planned your mall, designed your mall banner, Notice Board ad banner (if you decided to do one), and any other graphics for your mall, and your website is complete! You have officially created your first mall! This means you're ready to invite people to join! Your best bet for recruiting members is to look on the shop chat board. Sometimes you can find people looking for malls there. If you don't see any, go ahead and make your own thread with a catchy title to advertise your mall. Your first post should include a link to the mall website and the shop size requirement. So what do you do now? Wait. Keep posting on your advertising thread, and be patient. Patience is key to recruiting. If you don't have patience, you won't be successful. If you have a few thousand neopoints floating around that you're not afraid to part with, you can also put up an ad on the notice board for your mall, though this really isn't necessary. You may pull in a few new members quicker this way, but you can fill your positions on the shop chat board. We have discussed recruiting new members, but once you get new members, you need to keep them interested and happy with your mall. Doing the following things will help keep members active and enjoying your mall. Things need to be updated! The mall banner, website, etc. You should be able to make a new banner for every season or holiday. A Valentine's Day theme, spring, summer, Thanksgiving, Christmas, winter, and any other holidays or seasons you may want to include. Your mall banner should also be updated when you have a new member or a member resigns. This is the MOST important update you will do! Your website should also be updated, though not as often as your mall banner. A simple change of home page banner and colors will suffice, and it does not have to be updated as often as your mall banner. Your member section should be updated weekly or less if you have the time, and news should be updated when you have any. Another way to make sure your members are active is to give them goals. A few ideas are upgrade goals and stock amount goals. Keeping members busy will keep them active. You can also host activities for members, like Shop of the Month. Shop of the Month is just like it sounds - you choose the best shop (or let your members decide) each month, and that shop will get a special spot on your mall banner. Keep the activities going. Be creative! Now that you've read this guide, you're probably bursting to begin working on your mall! Well, what are you waiting for? Get out there and create the best mall you can! If you get stuck, just refer back to this guide when need be. Best of luck to you!